The options can seem endless when it comes to engagement ring designs, making it near impossible to choose a style you love. But if you're the type of bride who's looking for something a little bit outside the traditional realm of engagement rings, you've come to the right place. We spoke with independent jewelry brand Catbird, whose marketing manager, Sriya Karumanchi, shared, "For the past few years now, we’ve seen people really embrace rings with unexpected stones and cuts, a pretty significant departure from rings focused on the white diamond center stone. Opals, emeralds, deep sapphires, and gray diamonds in unconventional settings are some of our most popular this year." We're noticing a major trend in ring designs that favor the unexpected and offbeat over the perfectly symmetrical. While design elements like clear diamonds and symmetrical settings have long been the standard for engagement rings, many brides are shifting how they place value in an engagement ring. "I think the perspective has shifted. The value of a ring doesn’t have to solely come from a set of rules determined by the jewelry industry—cut, clarity, carat, and color being the common ones," Karumanchi explains. "The value is rooted in what you hold in the piece. It can be from the sentiment of a family heirloom, or maybe a special stone and motif that really spoke to you when you tried the ring on." 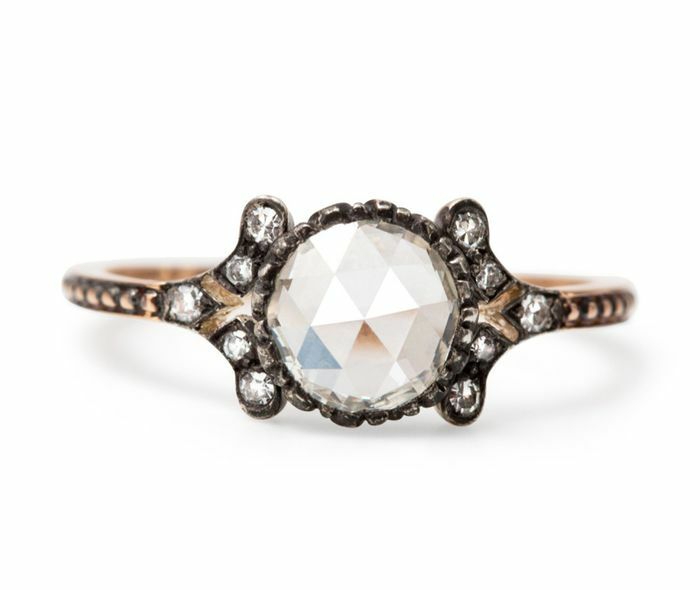 Instead of simplistic placements, below you'll find ornate settings on vintage-inspired rings. Instead of regular diamonds, you'll see rich colors, and instead of round or square-cut stones, it's the unexpected shapes you'll find on the following unique engagement rings. From beautiful vintage-inspired settings to more modern diamond arrangements, brides are opting for engagement rings with truly unique displays of stones. This darker setting evokes a mysterious romantic feeling. Round and square-cut diamonds are just stunning set on this vintage-inspired ring. We could stare at this intricate ring all day. The framing of the main stone is just stunning. Suspended between the two bands, this modern setting creates a cool negative-space effect. Refreshing sapphire, warm yellow, and moody amethyst are all the unexpected colors that you'll find featured on many of the unique engagement rings trending right now. An artfully stacked ring is a stylish alternative to a standard engagement ring, and the stones in refreshing shades of blue work so well with the nontraditional design. This rose-cut black diamond is perfectly dainty yet totally one of a kind. The clean lines and slender micro-pavé-set diamond band frame this stunning yellow diamond. Brilliant purple stuns on this nature-inspired ring, set with a pretty twisted band. Let the name "True Blue" represent more than just the stone's color. The night sky is a major source of inspiration for these beautifully whimsical designs. You'll find stars, the moon, and constellations as motifs in a number of these unique rings. This magical ring looks as if it were sprinkled with actual stardust. This ornate design is both instantly compelling and yet stunningly dainty. The diamond placements are reminiscent of stars in the night sky. This asymmetrical arrangement is inspired by constellations in the night sky. The combination of smaller stones here makes a subtler impact. While round and square-shaped stones are the classic designs that will always stand the test of time, stones with a less common shape are the "delightfully unexpected" engagement rings that more and more brides are opting for. I've never seen a stone cut quite like this before. This ring doubles the fun. The double stones are such a fun and unexpected twist. The designer describes this pretty ring as "delightfully unexpected," and we couldn't agree more. Traditionally speaking, diamond engagement rings have consisted of a single stone perched atop a medium-weight band. 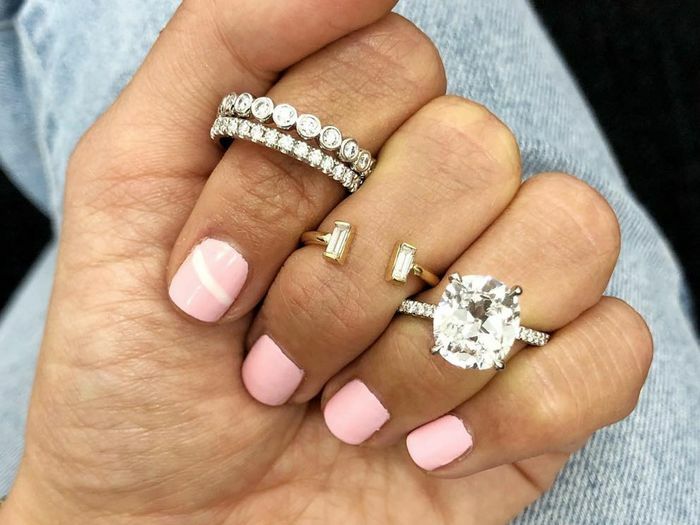 However, thicker bands are the unique engagement ring trend quickly coming into favor for their more substantial look and feel and they skew the line between engagement ring and wedding band. We love the clean lines on this one. Easily stack this up with your other rings. The center stones really pop. This post has been updated by Anna LaPlaca.